1915: Barney Oldfield won the Venice Grand Prix held in Venice, California driving a Maxwell. Oldfield averaged 68.3 mph for the 300 miles. 1962: The Rand Autumn Trophy held in Kyalami was won by John Love in a LDS-Porsche 4. 1963: Fred Lorenzen drove a Holman-Moody Ford to a 1 lap win in the NASCAR Grand National Atlanta ‘500’ on the 1.5 mile Atlanta International Raceway. Fireball Roberts took himself out of contention on lap 268, losing a lap when he spun his Pontiac in turn 2 after exiting the pits. Roberts edged fellow Pontiac driver Bobby Johns by two feet to take second. Herman Beam’s 84 race finishing streak ended when the clutch failed on his Ford. 1968: David Pearson finished strong at Bristol (Tennessee, US) International Speedway, leading the final 31 laps of the Southeastern 500. 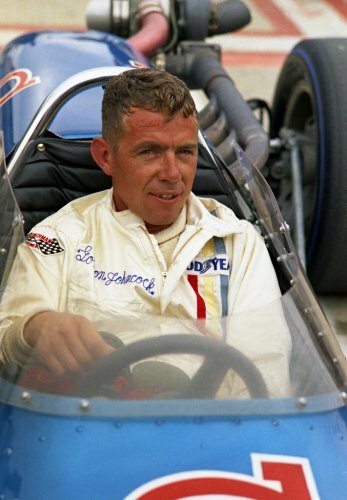 1968: Gordon Johncock took advantage of a late mistake by Bobby Unser to win the USAC Championship season opener, the ‘California 200’ at Hanford Motor Speedway. Johncock was running a distant 3rd with 14 laps to go when Unser went too hard into turn 1 in an effort to beat Roger McCluskey into the turn. Unser spun up the banking and 2nd running Art Pollard hit the wall trying to avoid. Unser restarted after losing a lap, but Pollard was out. 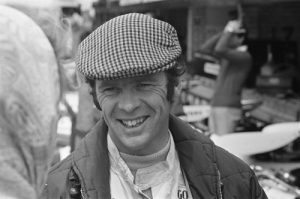 Having been in a lengthy battle for the lead with both McCluskey and Pollard, Unser apparently wasn’t aware that McCluskey had lost a lap after a recent stop for fuel. Joe Leonard escaped injury after his new Brawner-Ford hit the wall and burst into flames on lap 53. Unser won the pole in his turbocharged Offy powered Eagle with a speed of 155.709 mph on the 1.5 mile banked paved tri-oval. Sonny Ates and Gary Bettenhausen both made the starting field in upright dirt cars, as did a front engined roadster. It was Johcock’s 2nd straight win at Hanford, both coming in the waning laps. In the Fall 1967 race, Pollard ran out fuel while leading and Leonard crashed with 3 laps left to give Johncock the win. 1974: Wally Booth drove his AMC Hornet to victory over Jack Roush’s Mustang in the Gatornationals Pro Stock finals. It was the first NHRA Pro Stock win for American Motors. 1974: Jacky Ickx driving a Lotus-Cosworth 72E claimed victory in the Race of Champions at Brands Hatch. 1974: Mike Mosley drove a Drake-Offenhauser powered Eagle to victory in the USAC Championship race at Phoenix, Arizona, USA . 1985: Bill Elliot won the NASCAR Winston Cup race at Atlanta, Georgia in a Ford Thunderbird. 1996: Andre Ribeiro won the Rio 400 in Rio de Janeiro, the first CART race run in Brazil. 2002: The Malaysian Grand Prix was held at Sepang. 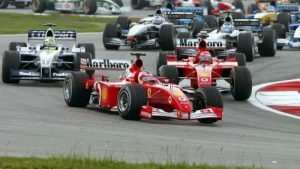 The Grand Prix is notable for the first lap collision between Williams driver Juan Pablo Montoya and Ferrari’s Michael Schumacher, which led to the Colombian being given a drive through penalty. 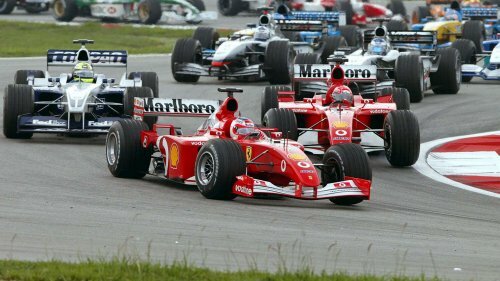 This decision led to much criticism for the Malaysian stewards, with the victim of the incident, Schumacher, commenting that the decision was “overly harsh” on Montoya. The Grand Prix was won by the Williams-BMW of German Ralf Schumacher, who commented that it was “almost a perfect race”. 1917: Wally Booth drove his AMC Hornet to victory over Jack Roush’s Mustang in the Gatornationals Pro Stock finals. It was the first NHRA Pro Stock win for American Motors. 1927: Wade Morton set a US stock car record, driving an Auburn 8-88 1,000 miles at an average speed of 68.37 mph at the Atlantic City Speedway, New Jersey, US. 1929: Bill Lowe drove a Lombard to victory in the 1100cc class of the Australian Grand Prix, held at Phillip Island. 1972: Bobby Unser led most of the way to win the 150 mile USAC Championship race at Phoenix International Raceway. Unser pulled away from Mario Andretti following a restart with 3 laps to go, crossing the line 4 seconds ahead of Andretti’s Parnelli Jones Colt-Offy. In qualifying, Unser’s new Eagle-Offy shattered the lap record with a speed of 141.966 mph, seven mph above the previous mark. 1973: Henri Pescarolo, Gerard Larrousse and Francois Cevert teamed in a Matra-Simca to win the ‘6 Hours of Vallelunga‘ World Championship for Makes race, in Italy. The winning trio completed 290 laps of the Vallelunga circuit, finishing a lap ahead of the Ferraris of Tim Schenken/Carlos Reutemann and Jacky Ickx/Brian Redman. 1973: “Dyno” Don Nicholson became the first NHRA Pro Stock racer to reach 150 mph at the end of the 1/4-mile when he run 150.50 mph at Gainesville, Florida, USA. 1974: Wally Booth drove his AMC Hornet to victory over Jack Roush’s Mustang in the Gatornationals Pro Stock finals. This was the first NHRA Pro Stock win for AMC. 1977: José Carlos Pace (32), Brazilian Formula One driver was killed in a light aircraft accident, just days after the 1977 South African Grand Prix, in which Tom Pryce was killed after running over Jansen Van Vuuren. The track which hosts the Brazilian Grand Prix annually now, as a tribute to him, bears his name, Autódromo José Carlos Pac. 1978: Gordon Johncock won the USAC Championship ‘Jimmy Bryan 150’ at Phoenix International Raceway. Johncock and Danny Ongais dueled for the win until the clutch began slipping on Ongais‘ Interscope Parnelli/Cosworth. Pat Patrick’s Wildcat/DGS entries finished 1-2 with Steve Krisiloff a career best second. Ongais won the pole with a 24.76 lap (145.396 mph). In the preliminary Mini Indy (Super Vee) race, future NASCAR star Tim Richmond won in his first start in the class. 1979: Buddy Baker broke a long dry spell, winning the NASCAR Grand National ‘Atlanta 500’ in Harry Ranier’s Olds. It was Baker’s first GN win since May 2, 1976. Baker took the lead from a sputtering Bobby Allison with 24 laps left, taking the checkered 18 seconds ahead of Allison’s Bud Moore Ford that had lost a cylinder. The race was marred by the death of Dennis Wade, jackman for rookie Dave Watson. Wade died when struck on pit road by Watson’s out of control car. Watson was leading the race at the time of the accident. The Wisconsin short track ace withdrew immediately and never made another GN start. 1984: Benny Parsons outdueled Dale Earnhardt and Cale Yarborough to win the 500 mile NASCAR Grand National race at Atlanta International Raceway, Georgia. It was Parsons first Grand National win in nearly 3 years, the 21st of his career, and would be the final of his career. 1991: Ken Schrader landed his third victory in NASCAR’s top series, pulling away to a 3.02-second victory over hometown favourite Bill Elliott at Atlanta Motor Speedway, Georgia, US. Dale Earnhardt finished third to retain his early grasp on the points lead, which would eventually become his fourth NASCAR championship. 1995: Fermin Velez, Eric van de Poole, and Andy Evans drove a Ferrari 333SP to victory in the 12 Hours of Sebring. 2001: Michael Schumacher won the Malaysian Grand Prix held at Sepang from pole and outpaced his teammate Rubens Barrichello who finished second 23 seconds behind. David Coulthard finished third and his teammate Mika Hakkinen, set the fastest lap but could do no better than 6th at the finish. 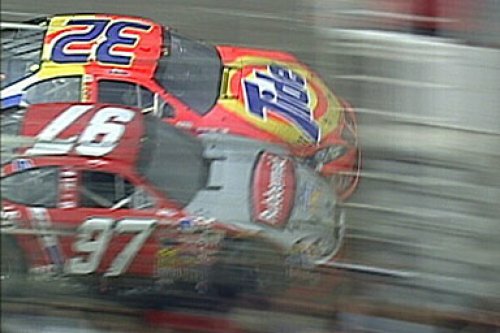 2003: Kurt Busch and Ricky Craven battled in one of the greatest last-lap finishes in NASCAR history at the Carolina Dodge Dealers 400. 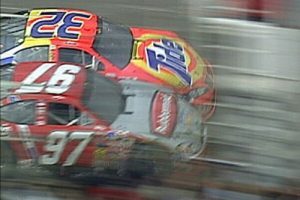 The two cars pounded each other relentlessly around Darlington Raceway for the entire final lap, and engaged side-by-side coming out of the final turn. Slamming fenders and turning into each other down the frontstretch, the two cars crossed the line together, with Craven taking the victory by 0.002 seconds. It was the closest finish in NASCAR history, since electronic scoring equipment had been introduced. 2003: Karl Kling, German F1 driver died in Gaienhofen on Lake Constance, Germany due to natural causes. He was 92. It has been stated that Kling was born too late and too early. Too late to be in the successful Mercedes team of the ’30s and too early to have a real chance in 1954 and 1955. Unusually, Kling found his way into motorsport via his first job as a reception clerk at Daimler-Benz in the mid-1930s, competing in hillclimb and trials events in production machinery in his spare time. During the Second World War he gained mechanical experience servicing Luftwaffe aircraft, and after the cessation of hostilities he resumed his motorsport involvement in a BMW 328. Kling was instrumental in developing Mercedes’ return to international competition in the early 1950s, and his win in the 1952 Carrera Panamericana road race, driving the then-experimental Mercedes-Benz 300SL was a defining point in assuring the Daimler-Benz management that motorsport had a place in Mercedes’ future. Called up to the revived Mercedes Grand Prix squad in 1954 he finished less than one second behind the legendary Juan Manuel Fangio on his Formula One debut, taking second place in the 1954 French Grand Prix at the fast Reims-Gueux circuit. This promising start was not to last, and with the arrival of Stirling Moss at Mercedes in 1955 Kling was effectively demoted to third driver. 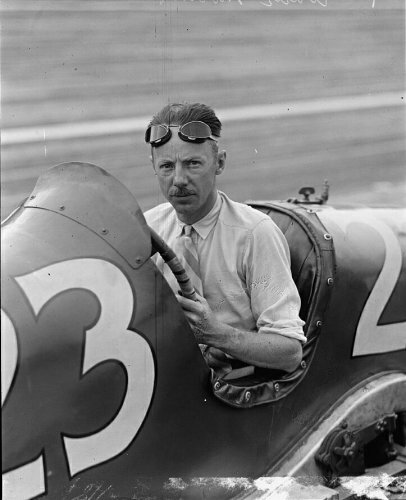 However, away from the World Championship, Kling took impressive victories in both the Berlin Grand Prix (at AVUS, another high-speed circuit) and the Swedish Grand Prix. He left the Formula One team at the end of the season, to succeed Alfred Neubauer as head of Mercedes motorsport. He was in this post during their successful rallying campaigns of the 1960s, occasionally taking the wheel himself. On one such occasion he drove a Mercedes-Benz 220SE to victory in the mighty 1961 Algiers-Cape Town trans-African rally. 2007: Finnish driver Kimi Raikkonen (cover image) won on his Ferrari debut at the first round of the 2007 championship, held in Australia. He had defected from previous team McLaren after a number of race victories but no championships. McLaren had replaced him with young hotshot Lewis Hamilton who impressed everyone in the paddock and around the world with his measured and mature drive to third in his fist ever Formula One race. There was criticism for Bridgestone, as the markings on the softer of the two tyre options could not be easily seen when the car was on track, at the following race the small dot was replaced with a white line in the second groove of the tyre.